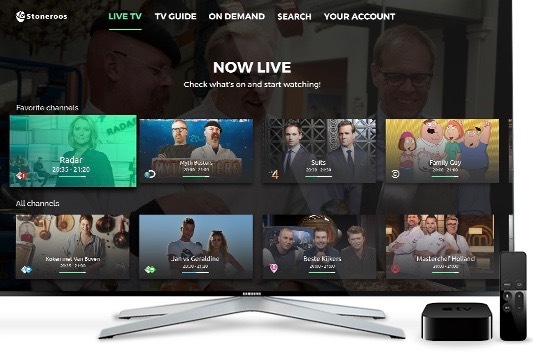 The OTT live and on-demand Apple TV app developed by Stoneroos for T-Mobile’s streaming service Knippr has won the best Apple TV app 2016 from iCulture. The app features the patented Stoneroos EPG, which shows the channels side by side, as has been proven to be a success in earlier EPG’s made by Stoneroos. While scrolling up and down within a channel, all other channels jump to the right time slot, providing a horizontal overview of all programmes that are broadcast at the same time. “Due to a lack of computing power in older set-top boxes this solution was not possible on legacy sets, but with the Apple TV4 box this format has finally become a reality, bringing the potential to dethrone the old fashioned grid view,” according to the developer.